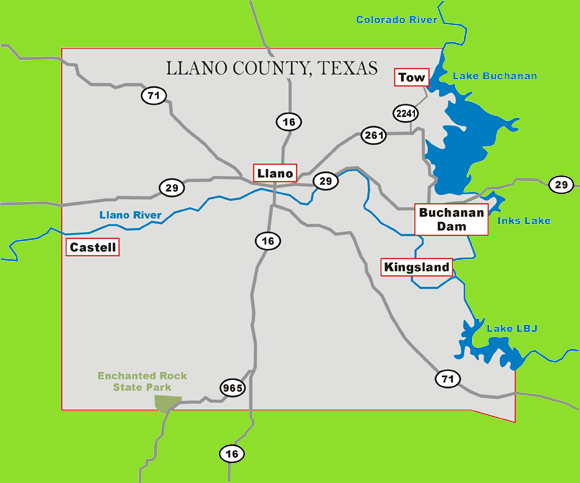 Llano county is centrally located within Texas and it is a part of Texas Hill Country. 1. Start with I-10 North and take 87 to Fredericksburg. Fredericksburg is a great place to stop for a break or a lunch. 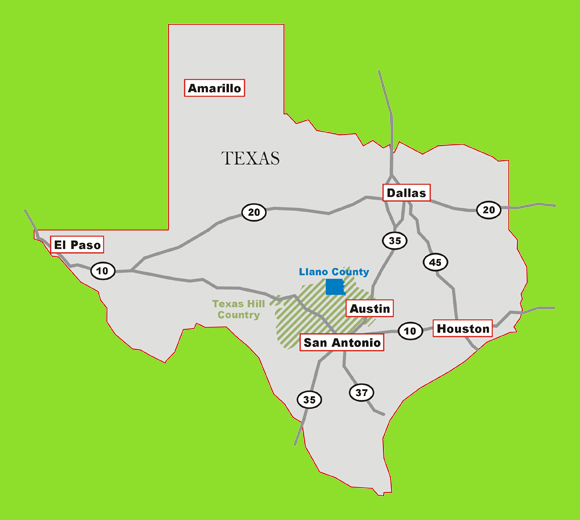 From there, take 16 North and then 71 to Llano. Optionally, you can make an excusion to Enchanted Rock State Park by following Farm to Market 965. From Llano, take scenic 29 East to Buchanan Lake. 2. Follow 281 North through Blanco, Johnson City, Marble Falls to Burnet. From Burnet take 29 West to Buchanan Lake and Llano city. Both routes take approximately same time--about two hours. Two major routes from Austin are 71 West (from South Austin) or 29 West (from Georgetown). Both are approximately take an hour, and both offer interesting stops along the way and scenic rides. Turn Right/West on 29 in Burnet and it will take you to Buchanan Lake.